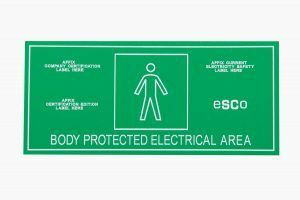 ESCO Medicon offers a series of Medical Area Signs which have been produced to comply with AS3003 for clear identification in Patient Care Areas. The 200mm W x 90mm H acrylic plate is easily fixed to the wall surface by a self-adhesive backing. Each sign provides an Area “to attach” removable labels for recording the test date and testers signature, company details & compliance test details. ESCO Medicon supply Uni-Rail equipment mounting rail systems to suit specific customer length and accessory requirements. The rail is extruded high tensile aluminium, finished in satin clear anodise. When the customer requests a specific length, the full rail is manufactured complete with end caps, in-fill, wall brackets and coach fixing screws. Uni-Rail can be mounted either vertically or horizontally and can accommodate ancillary equipment such as Hose Support Boom Arms and monitor brackets. ESCO Medicon provides the Hose & Cable Support Boom arms as a safety product which removes hoses and cables from the floor in order to comply with HSE requirements in a Healthcare facility. 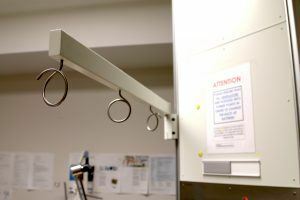 Hose Support Boom arms are available as either wall mounted or celling mounted and available as single arm or double arm (can be mounted to surgical services pendants, vertical equipment mounting rail, wall or ceiling).